Genie TS is a next-generation camera platform engineered to meet the critical performance and environmental requirements of challenging applications such as ITS. 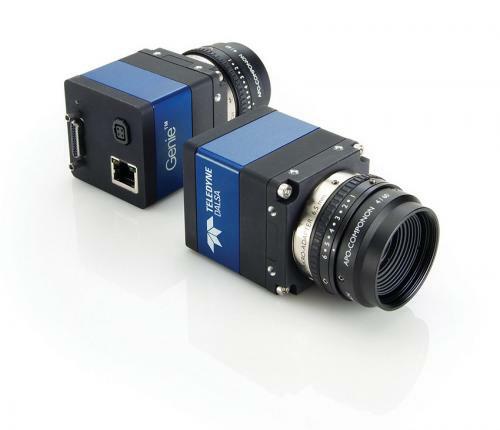 Powered by the latest image sensors including Teledyne DALSA's own advanced CMOS devices, the Genie TS family offers resolution from VGA up to 12 megapixel with extremely high quality resolution and frame rates as high as 300 fps, all with true global shutter functionality for crisp, smear-free images of high-speed action. Genie TS also provides remarkable dynamic range to ensure optimized image capture from sun-to-shade. Integrated features like motorized lens control with image-to-image aperture, zoom and focus functionality, auto iris, image compression, image transfer-on-demand, and both RS-485 and RS-232 ports, are all built into a tough compact body equipped with a GigE Vision Compliant, direct to PC, interface making high speed data transfer and multi-camera networks easy to deploy.